Your will leaves instructions for your loved ones regarding how you want your property distributed, and your loved ones might willingly follow your instructions to the letter. Sometimes, however, family and friends may dispute, or contest, terms of your will. Missouri allows certain persons to contest a will even if it appears valid, but you can take steps to discourage will contests. Only “interested persons” can contest a will, which includes individuals who stand to benefit if the challenge is successful. For example, if you disinherited your son in your will, he qualifies to file a contest since he would benefit if the court declares your will invalid. Even interested persons cannot contest your will just because they disagree with its terms. Instead, a contest must meet one of Missouri’s grounds for challenge, such as undue influence by an heir, existence of more than one will, evidence the will is fraudulent or proof that you were not of sound mind when you signed your will. For example, if you are mentally incapacitated you cannot make a valid will so a will created under such circumstances might be successfully contested. Will contests must be filed within six months of the acceptance of the will by the probate court or six months after publication of notice that the court granted letters giving authority to your estate’s administrator, whichever is later. If someone wishes to challenge your will, he must file the challenge in the circuit court of the county where your will is being probated. The challenger cannot simply insinuate there is a problem with the will. A successful contest requires proof that grounds exist, including witness testimony, documents or other evidence. For example, if the contest is based on undue influence, the challenger could provide evidence that another heir was too influential when you made your decisions. If you are concerned that your loved ones might contest your will, you can insert a “no-contest” clause into the document. No-contest clauses do not prevent someone from filing a contest, but they discourage challenges by completely eliminating inheritances for unsuccessful challengers. For example, if you leave 60 percent of your estate to your daughter and 40 percent to your son, your son will inherit nothing at all if he unsuccessfully challenges a will that contains a no-contest clause. The no-contest clause will not take away your son’s inheritance if his contest is successful. As Missouri courts strictly construe no-contest clauses, it is wise to rely on the aid of an attorney or online legal document preparation service in drafting your will. This will help ensure that your clause is properly written and recognized by the court. Whether or not your will contains a no-contest clause, a successful contest changes the way your estate is distributed. 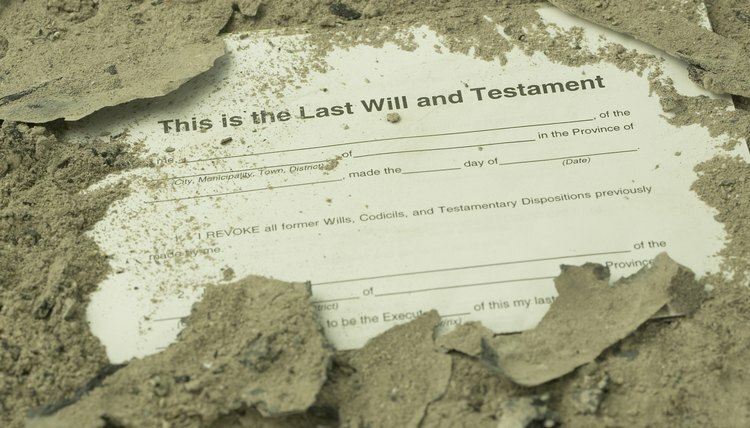 Typically, the court will either declare a portion of your will invalid, or find that your entire will is invalid and distribute your estate as if you died without a will -- or intestate. Missouri’s intestate laws give your entire estate to your surviving spouse if you have no children. If you have children who are all children of your surviving spouse, your surviving spouse inherits the first $20,000 of your estate’s value plus half the remaining estate. If you have children who are not children of your surviving spouse, your spouse inherits half your estate and your children share the other half.